You have seen the progress of this quilt here, and here. Also, the tutorial for it was published in FAVEQUILTS magazine. If you are interested, you will find all the measurements and details in this tutorial. I used several grey fabrics from the collection Sketch from Timeless Treasures. For the backing : Sketch Ivory from Timeless Treasures. For the binding : Cloud 9, from Elizabeth Olwen, Grey Abbey Organic Gentile Vines Dandelion. For the batting I used a thin organic cotton one. This quilt will be used as a light blanket for spring and autumn. For next winter I plan to make a warmer one, and for this purpose, I would welcome any advice on a warm and fluffy batting quality from you. 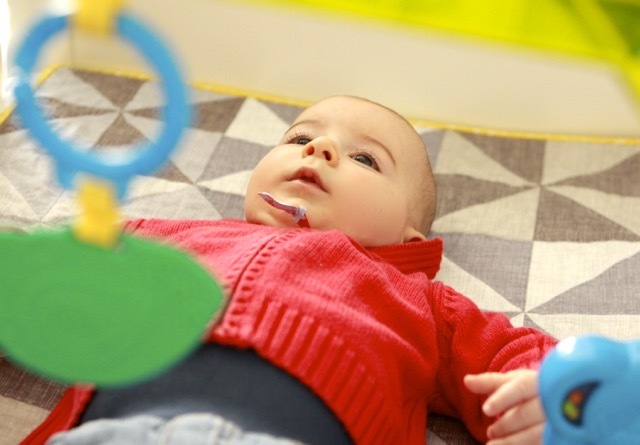 Many people were suspicious on using grey color for a baby quilt, but in fact I believe that, as babies' rooms are always overcrowded with lively colored toys, adding again colors in a quilt would be somewhat tiring for the eyes. However I allowed myself to make it less dull by adding a glittering yellow border. Hello Christine ! Comme tu as raison pour les couleurs ! Entre les habits et les jouets, ce ne sont que couleurs très vives alors, ton très joli quilt adoucit un peu tout ça !! Bonne journée et gros bisous ! Oh I love how your big stitches really made this quilt come alive The yellow binding is wonderful! 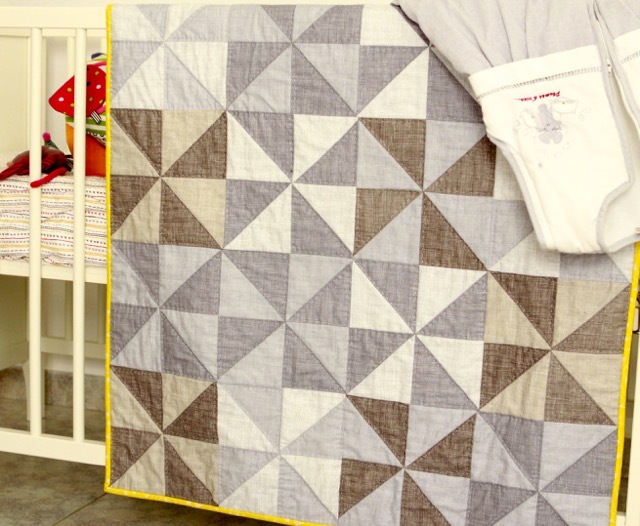 It must have been a joy to work on this quilt for this special little baby! How adorable in those cute sweaters. The subtle color changes and that bright binding - oh it's fabulous. It is absolutely lovely - especially with the cute little boy on it. 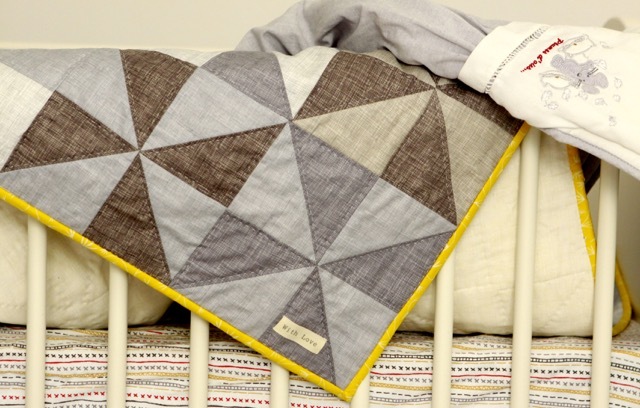 I absolutely love the grey fabrics for a baby and the touch of yellow for the binding looks great. 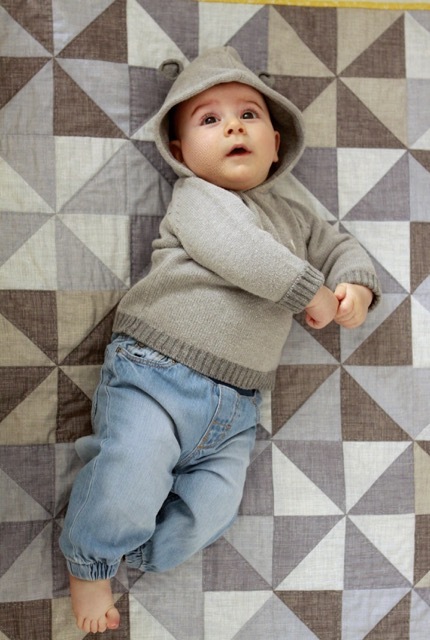 Beautiful quilt and an adorable baby boy. I think for a warmer quilt you could use 100% wool batting which I have used and is lovely. 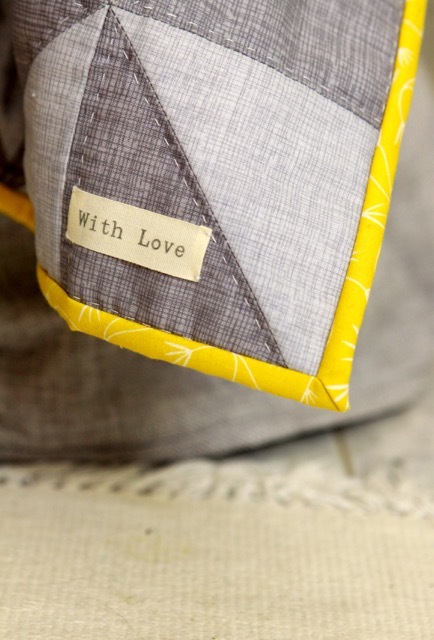 The flash of yellow binding is perfect with your quilt colours! I think this quilt is beautiful and restful. Love the grays. What a great way to combine all those grey tones. I love the texture of the print too. Amazing quilt . 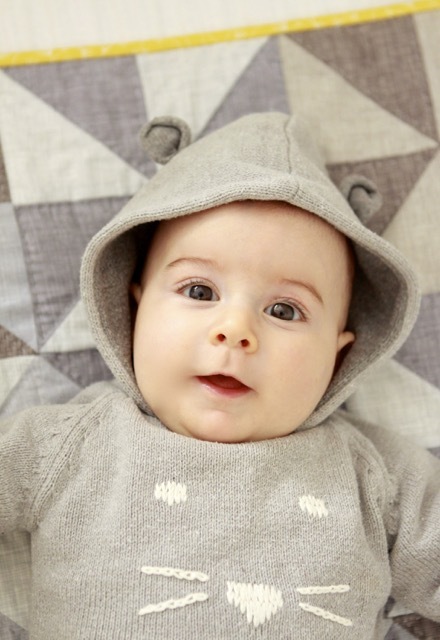 Such beautiful photos of the baby too! Warm and snuggly batting... wool! J'ai hâte d'avoir un bébé! Pour avoir un beau quilt je suis sure!!! The yellow binding is genius! 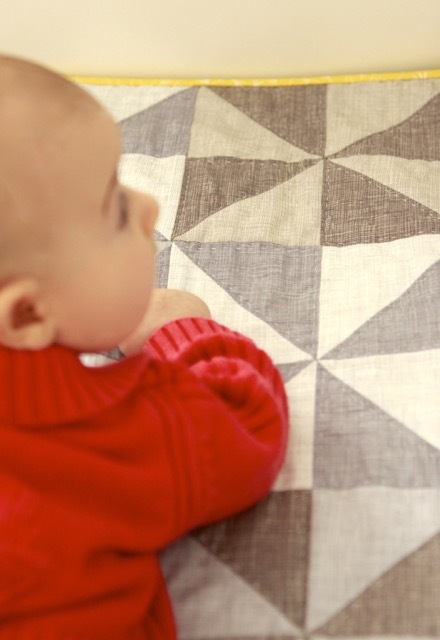 That baby is so adorable and the quilt is perfect. I love the soft sweet shades of grey. It makes a perfect background for photographing that sweet baby. Give him a snuggle for me! I love the quilt; the splash of color on the binding is just perfect! I have used that "sketch" line of fabrics myself and find them to be such a great "basic" that goes with so much. Well done! The baby is positively adorable! Oh the colours are just lovely, and that young man looks very happy with his quilt! 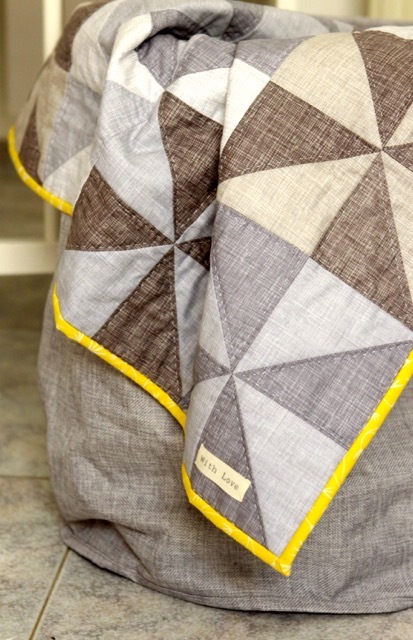 I love the big stitching as well and as for grey baby quilts, I made one as well for my grand niece. Gorgeous baby pictures. Beautiful! Such a peaceful quilt. And adorable baby! Нежное и очень похоже на льняное. Для детских вещей я часто использую лен, он очень красиво смотрится. Успехов в творчестве! Beautiful, healthy baby! What a little blessing he is. You made him a wonderful quilt! I love the soft grays and the touch of color in the binding. What a beautiful little guy! I have the AWWWW factor going on in high gear right now. i love this baby quilt! The theory you proposed about baby quilts in greys giving the eye a rest makes a lot of sense Christine! Plus it will go nicely with everything and in every room. 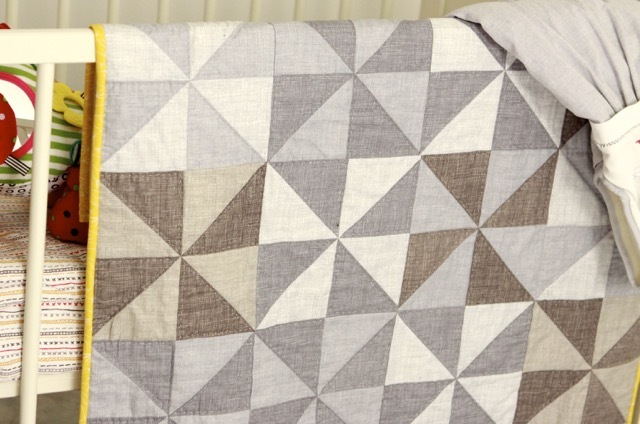 Love the hand quilting and simplicity of this quilt.